Most modern electronic engines have a digital interface called J1939. Maretron’s J2K100 is a gateway that converts the J1939 protocol to marine industry standard digital protocol called NMEA 2000. The J2K100 converts many engine parameters including RPM, boost and oil pressure, oil and coolant temperature, voltage, fuel rate, engine hours and more depending on the particular engine. The GPS antenna/receiver (GPS200) provides the vessel’s speed that allows the display to compute and show the fuel economy (gallons/hour or liters/kilometer). The following table shows the products included within this example system plus a list of the information or data available for display. 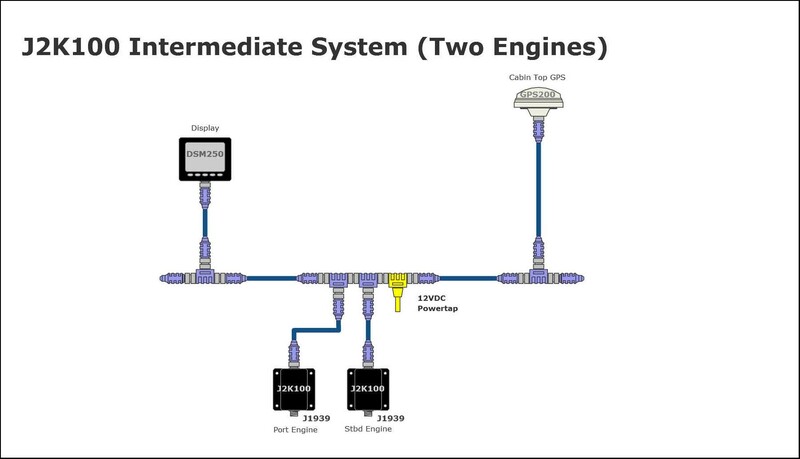 This file requires Maretron's free NMEA 2000® network design tool N2KBuilder® to be installed on your PC. The following screenshots (click to enlarge) are examples of how the engine status will be displayed on the DSM250. Copyright© 2019 Carling Technologies. All rights reserved. Visit Carling Technologies, our parent company.